Speaking at the 7th Meeting of Regional Economic Cooperation Conference on Afghanistan (RECCA) here, Mr Akbar accused Pakistan of committing crime against the Afghan people by blocking normal access between India and Afghanistan. 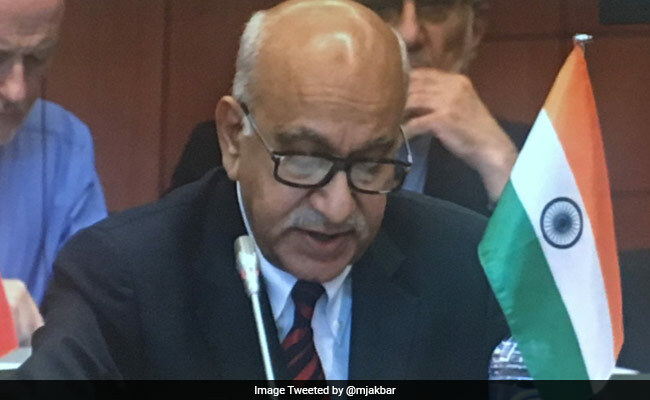 Ashgabat, Turkmenistan: Pakistan has emerged as the "largest wall in history", inhibiting connectivity between India and Afghanistan, Minister of State for External Affairs MJ Akbar said today. RECCA was initiated in 2005 to support the peace process in Afghanistan and build greater stability through economic co-operation in South, West and Central Asian regions. "India has always conveyed its readiness to receive export laden Afghan trucks at its Integrated Check Point at Attari on the India-Pakistan border. However, Pakistan has regrettably chosen to block normal access between India and Afghanistan," Mr Akbar told the gathering. "In effect, Pakistan has emerged as the largest wall in history, inhibiting connectivity between India and Afghanistan. This blockade is a crime against the people of Afghanistan; for it is their welfare which is affected the most," the minister added. For India, RECCA is vital because, as a powerful engine for economic growth, it shapes the aspirations of the young, Mr Akbar said, adding that India believes in both bilateral and multilateral mechanisms to help the Afghan economy. He said that despite visible and tangible improvements, Afghanistan continues to face a multitude of challenges such as terrorism, low investment, blocked or interrupted connectivity and fluctuating institutional capacity. Noting that India's overall developmental assistance to Afghanistan since 2001 has amounted to over USD 2 billion and in September 2016, it pledged another USD 1 billion assistance to the country, Mr Akbar said the thrust of New Delhi's efforts has been on capacity building, human resource development, infrastructure, connectivity, trade and investment. He said a key priority for India is building robust, reliable and year round connectivity for Afghanistan because the lack of connectivity directly impacts the economic, security and political stability in the war-torn country. Asserting that the trilateral transit and transport agreement via Chabahar between India, Iran and Afghanistan in May 2016 was a milestone, he said the first ship carrying Indian wheat grain assistance to Afghanistan reached Chabahar from where it was taken overland to Afghanistan this month. "It is the beginning of a new era of enhanced connectivity for Afghanistan, West Asia and beyond to the larger Eurasian regions," he said, adding that another major milestone was the India-Afghanistan Air Freight Corridor, which began operations in June 2017. He said that nearly USD 250 million worth of deals were discussed between businessmen and entrepreneurs of the two countries at the India-Afghanistan Trade and Investment Show in September 2017 in New Delhi, and several were finalised.